are expanded to include the case of coupled fluid systems. Numerical solution results are given for an illustrative application. The mathematical model, an exact continuous analogue of the discrete approximations used in many numerical solution methods, provides analytical and numerical-benchmark problems for verification by the Method of Exact Solutions ( MES ). I have uploaded a file. I have completed some additional verification of the single-node calculations, and other results, given in the previous notes here. A short introduction to implicit function theory was given in the notes here. In the present notes I’ve tuned up the original calculations and cleared out a few bugs as follows. (1) I found some bugs in the summary tables of the EOS derivatives and give new Tables below in these notes. I have also posted the corrected Tables with the notes introducing implicit function theory. (2) I have made the fluid thermodynamic state and thermophysical properties more consistent by using a single source for these numbers. The source is an old National Research Council ( Canada )/ National Bureau of Standards ( USA ) water property program. For the original calculations I had used whatever convenient values could find and these did not always correspond to the exact same fluid state. The program is based on the equations in this document. (3) I coded the fluid properties and the primitive elements of the derivatives along with a routine to numerically evaluate the various determinants in order to compare these with my analytically derived derivatives. This process led to discovery of several coding errors that, when cleared, led to agreement with my analytical derivatives. And, yes, coding of the analytical derivatives was also verified by various means. I have abandoned the original spread sheet approach and now rely on the new coded routines. (4) I have tuned up the wall-material properties and at the same time expanded the discussion of the interaction of the fluid and wall material relative to the base pressure-wave speed. (5) I dug into the fluid-structure literature a little bit to see if my derivation of the effective sound speed was correct. I discovered that the formulation obtained by use of implicit function theory and the equation of state gives exactly the classical value. That equation was first obtained, as reported by Tijsseling ( 1996 ), by Korteweg in 1878. The center of the hydraulic-transient / fluid-structure-interaction universe seems to have moved from the University of Michigan and Wiggert, Wylie, and Streeter, to Tijsseling and Eindhoven University of Technology. (6) I have investigated the numerical solution method in some more detail. The second-order explicit Euler method shows growth of the difference between the analytical and numerical solutions. The fourth-order explicit Runga-Kutta method shows much improved performance. All these changes have been implemented and additional calculations carried out for the single-node case. The better focus on the calculations in contrast to the theory has also led to corrections in the consistency of the reported values for the calculations. The length of the node was incorrectly reported in parts of the previous notes. The mathematical model seems to be a very good candidate for production of Method of Exact Solutions ( MES ) and Numerical Benchmark results for Verification of numerical solution methods for transient, compressible hydraulic-transient codes. I have uploaded the file. I see that the Table 3 did not come out too good in the file. A copy is also here. There was a bug in the first column of the third row. In a previous post I gave some background info about implicit function theory and how it might be useful. 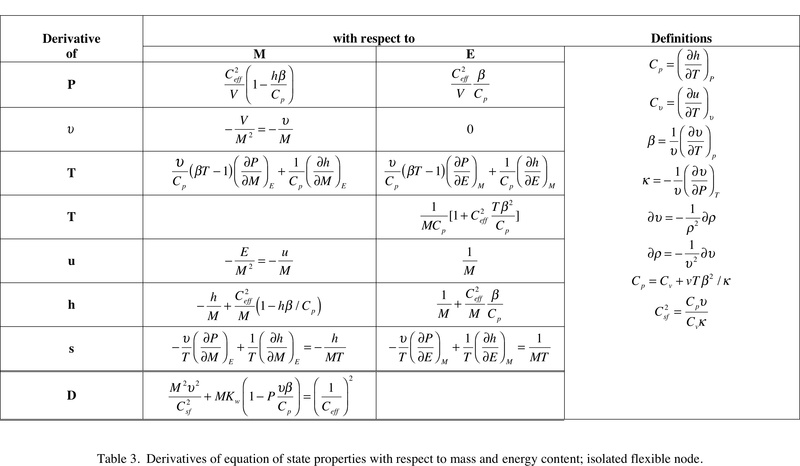 In these notes I have used results from applications to the equation of state to develop a few exact solutions for extremely simple transient, compressible flows that include fluid-structure interaction. These notes address the case of mechanical coupling of the fluid to a deformable / flexible wall. I have also included an introduction to the case of coupling of fluid systems through a common deformable / flexible wall. Additional notes will address the case of thermal interactions for both a single fluid system and coupled systems. I kind of ran out of steam when I got to coupled-systems part of the present notes. There’s a lot of ground to cover for this case and I’m thinking a separate report might be the way to go. With coupled systems you get more that just twice as many things to look at compared to the single-system case. I think these solutions might be candidates for analytical, and numerical-benchmark-grade, Method of Exact Solutions ( MES ) for verification of limited aspects of coding of transient compressible fluid flow model equation systems and solution methods. Consider these notes as a rough draft of a report and let me know what you think about all aspects. This is interesting; Computational science: …Error. From Nature News, even. Comments allowed over there. Related; Publish your computer code: it is good enough.